Amid all the buzz about personalizing learning, what can we learn from schools getting great results? In Public Impact’s new report with the Clayton Christensen Institute, Innovative Staffing to Personalize Learning, we analyzed eight schools and school networks that are not only personalizing learning, but also getting strong learning results with disadvantaged students. What’s different about these schools compared with the norm? New staffing models combined with blended learning. In these schools, blended learning does not replace teachers. Instead, blended learning augments the ability of multiple adults to understand and meet the needs of individual students in a collaborative workplace. Research about Public Impact’s Opportunity Culture initiative has already shown positive student learning gains in district schools where multi-classroom leaders lead small, collaborative teaching teams, many of which use digital tools to keep track of student progress. But what about these other efforts? Innovative roles on a career path. New roles helped multiple adults connect with students and support one another on a career path. Roles were generally on a continuum and included teacher-leaders of small instructional teams, who often planned and directed the team teachers’ instruction, coached the teachers, and analyzed data; collaborating teachers who worked in teams and supported one another more than typically happens for classroom teachers in traditional schools; support staff who tutored or mentored students; and teachers-in-training, who supported other teachers and taught while learning on the job in paid fellowships or residencies. Adult–student connection. Critically, adults in each role worked directly with students, often in small groups or one on one for a portion of each day. Intensive educator collaboration. Small teaching teams and co-teaching helped those adults thoroughly understand each student and personalize teaching. Collaboration let multiple adults share what they learned about each student—personal factors, interests, strengths, and barriers that might affect learning. This gave everyone more insight into why students were excelling or stalling, not just what students knew, allowing teachers to personalize how they engaged each student. Cultures of intensive coaching. Weekly or even daily observations and feedback supported rapid educator improvement and consistent instruction. Roles, responsibilities, and schedules were all designed to support openness and honesty about strengths and improvement opportunities. Blended learning for data and differentiation. Using blended learning for part of each day provided the time for more small-group instruction, and gave teachers more real-time student learning data. This helped teachers understand what students knew and keep progressing in their learning. 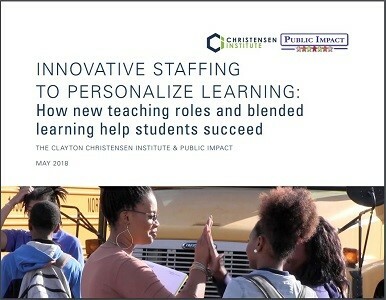 Schools were able to regroup students frequently, quickly respond to struggling students, and help teachers improve by pinpointing instructional planning and professional development needs. Other commonalities emerged, as well: Principals focused on reinforcing high standards, and created schedules that made school-day teacher collaboration possible. Many schools provided their staff with higher compensation within existing budgets; some used philanthropy to support a portion of their program, but most worked with regular funding. Had more opportunities to work on individualized, self-paced instruction in small groups and individually. Set personal goals and had more choices in where and how they learned. Formed strong relationships with multiple adults, who could then support them more consistently. While more research is essential to test and validate the factors that contribute to success, school designers and system leaders can learn from successful examples of innovative staffing combined with blended learning. Tools and examples to replicate the practices most directly linkable to student learning are essential for scaling up across the country with positive effects on students, especially those left out of success in too many schools today.